For complete World Cup 2014 coverage, visit Yahoo Sports and follow @YahooSoccer. 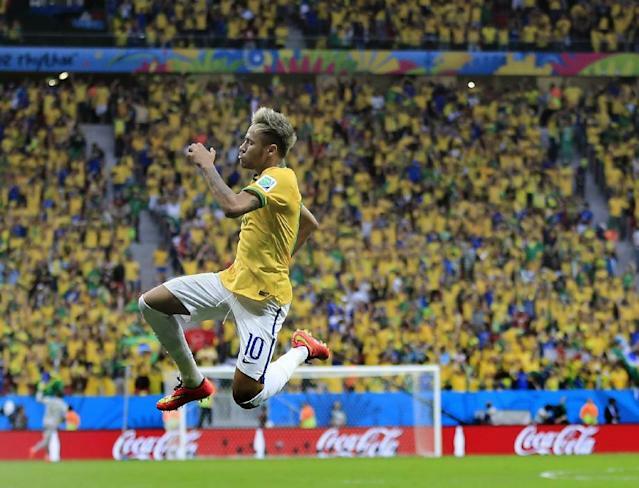 Brazilian superstar Neymar entered the 2014 World Cup as a marquee player primed to reach new heights of fame and accomplishment on home soil. After two opening matches of ups and downs, the 22-year-old came through with a gorgeous, milestone-hitting finish in Brazil's third match of Group A vs. Cameroon. Neymar's third goal of the tournament wasn't just worthy of a second look — it also marked two special milestones. It was the 100th goal of a high-scoring 2014 World Cup — by contrast, the 100th goal of the 2010 World Cup in South Africa wasn't scored until the final two concurrent matches of the group stage. It was also a special day in the soccer history of the most successful nation in World Cup history. The contest with Cameroon marks Brazil's 100th match in World Cup history. It's as yet unclear if the 2014 squad will hoist the trophy for the sixth time in the country's history — no other nation has won five — but they look like one of the top contenders. At 22 years old, Neymar now has 35 goals in 52 caps for an average of just over two every three appearances. His second goal put him past the legendary Rivaldo for sixth on Brazil's all-time list. The names in the top five — in order: Pele, Zico, Ronaldo, Romario, and Bebeto — indicate just how much this young superstar has accomplished in his short career. Chances are there's a lot more to come, in the next few weeks and beyond. Eric Freeman is a writer for Yahoo Sports. Have a tip? Email him at efreeman_ysports@yahoo.com or follow him on Twitter!